The genesis for Nikolas Barry-Shaw and Dru Oja Jay’s book, Paved with Good Intentions: Canada’s Development NGOs from Idealism to Imperialism (Fernwood Publishing, 2012), was the discovery that Canadian development non-governmental organizations (NGOs), even those considered progressive, aided in the 2004 coup to overthrow Aristide in Haiti. They gave resources to his opponents, and continued to demonize Aristide and his grassroots movement, Lavalas. 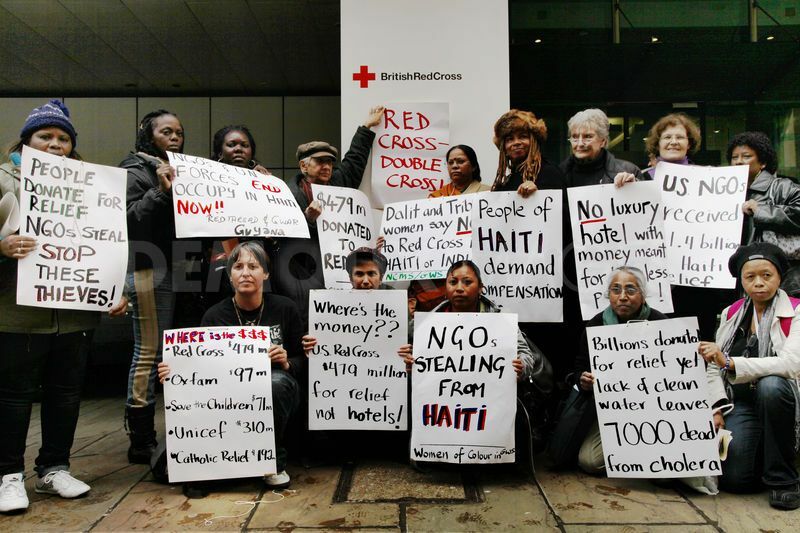 The authors, members of Haiti Action Montreal (linked with Canada Haiti action network), were especially shocked at the stance of Alternatives, a Montreal based group, and began to question the role of NGOs in general. Their first realization was that these organizations are not really non-governmental. The major development NGOS, supposedly operating to bring democracy and prosperity to poorer nations, normally receive half their budget from the Canadian government, principally through the Canadian International Development Agency (CIDA). Any significant amount from a single donor (as opposed to genuine grassroots funding) leads to powerful control over the activities of an organization. NGOs wishing to receive funding could not criticize Canadian foreign policy; the radical groups of the 1970s were defunded and the remaining ones were “increasingly in bed with the government.” The Canadian government in turn, despite its (benevolent pacifistic social democratic) image amongst some in Canada and elsewhere, cooperated with the United States, the European Union and the United Nations, to install and support a murderous regime in Haiti. The CIDA paid the salary of the new Deputy Justice Minister and the Royal Canadian Mounted Police trained the police, which engaged in atrocities. Among the NGOs the authors cite are Canada World Youth, Canadian Hunger Foundation Partners in Rural Development, Oxfam Quebec, Development & Peace, and Canadian University Service Overseas. They share with the Canadian government an official ideology: the poor need resources. It is a technical matter, not ideological or political. The Canadian development NGOs are part of a worldwide explosion of the same. Some were created to deal with the social costs of International Monetary Fund rules. These promoted anti-poverty measures that did not interfere with neo-liberalism, which entailed a rollback from social welfare, end of subsidies of local industry and agriculture, privatization of government services, and shrivelization of the civil service. The universe of NGOs is now enormous. They have been sent by the West to salvage nations torn by invasions, overthrows, and exploitation. In the process they co-opt many members of the leadership class, drawing in both government employees and activists from grassroots political and social movements, as they pay high wages by local standards, and offer travel and other benefits. The NGO as an agent of imperialism is not new—remember the missionaries—but the scale is. The authors report 10,000 NGOs in Haiti, providing 80% of the basic services. Policies of the puppet government eliminating tariffs and importing cheap food, along with food aid, helped to destroy the agricultural economy. Peasants then migrated to the city, where there were no jobs and built shoddy houses compounding the earthquake devastation. Meanwhile, NGO cooptation through good jobs for educated people and make-work jobs for the poor, false propaganda, and violent government repression helped to devastate the Lavalas movement, originally inspired by liberation theology. Some NGOs (in Canada and elsewhere) are supported by concerned citizens. However, most financing is from government agencies, such as the US Agency for International Development and National Endowment for Democracy, Canadian CIDA, and cognate institutions in most wealthy countries; foundations; the European Union; and the UN. Even NATO funds development projects. The US projection to the world, which blurs civilian and military, public and private, overt and covert actions, humanitarianism and death squads, uses development aid as one of the tools of the Special Operations Forces. Especially in Afghanistan, NGOs are used to win “hearts and minds,” and are required to spy and not criticize “NATO” policy. In most of the projects throughout the world, NGOs of the “North” emphasize microcredit and microenterprise. These may create an informal economy as a survival tactic, but do not promote sustainable economic growth or make a nick on poverty. A current example is Bangladesh, full of NGOs and the location of their shining star: Muhammad Yunus’ and Ford Foundation’s Grameen Bank. The authors contrast the idealism of the radical Canadian NGOs of the 1960s and 1970s, solidarity groups supporting structural change in both rich and poor countries and democratic participation by the poor, with current government-funded development aid organizations, partners in neoliberalism. The same phenomenon occurred in many wealthy countries, including the “social democratic” ones. They describe the dampening of the international anti-globalization movement, which experienced a victory in 1998 with the defeat of the Multilateral Agreement on Investment. To avoid such problems, People’s Summits, to parallel the World Trade Organization and similar conclaves, were created by governments. The radical groups were excluded and the “reasonable” ones let in; the protests were stabilized and little change occurred. They call for a new solidarity activism to engage with anti-imperialist movements and to educate their own countries (whose citizens tend to venerate NGOs), about what is really going on in the aided nations. They have “guarded optimism” that the Occupy Wall Street movement signals “possibilities for a politics of common cause between the North and South.” Their website lists a core of groups doing good work currently, but they wish for more concerted efforts. The book, a pleasure to read, provides excellent information about aid groups in Haiti and elsewhere. It is especially welcome as it is rare to find critical studies of this gigantic transformation of government and resistance in the subjugated nations. One wishes that there were a large research crew to investigate the connections between the universe of NGOs and militarism and imperialism. Military contractor philanthropy is one part of the picture; the revolving door and interlocking directorates are others, e.g., Christopher Hansen was the American Association of Retired People’s chief lobbyist from 2003-2007. Before this he served as Boeing’s chief lobbyist—for 16 years, and before that 11 years as lobbyist for General Dynamics. John H. Biggs was a director of Boeing while he was Chairman, President and CEO of TIAA-CREF, the college teachers’ retirement fund. So much more could be unearthed; we need a Trojan Horse cavalry. Another, not unrelated, large question this book raises is: what were all the reasons for 1960s-1990s radicalism’s demise? The problems have not disappeared; they are apparently worse: militarism, endless aggressive wars, every kind of ecological devastation and human rights violation. Furthermore, we are much more aware of them. The internet makes it harder to hide or propagandize with impunity; the political, liberal, environmentalist, humanitarian, and activist types have adequate access to this technology but are very quiet. However, there appears to be more reasons for quietism. Why are so few young people joining together to save the world? Or perhaps not joining much for anything? Some obvious guesses: jobs with contractors, electronic and other distractions, student debt, high cost of living, drugs (legal and otherwise), pessimism et al. A better understanding of the social and personal psychology issues might help us to discover what is to be done. In the meantime, “Paved with Good Intentions” is not only a fine source of information, but might activate some to get moving before it is too late.